In Tulungagung regency, there is a famous marble mount that located in Besole village, Campurdarat district, about 18 km to east of Tulungagung town. 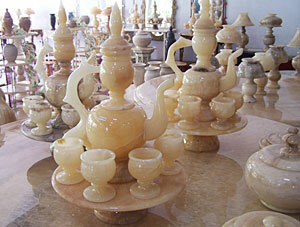 This area is also known as the center of Onyx handicraft that famous till to abroad. Marble is natural richness of Tulungagung. All marble spade used it for handicraft, such as; souvenir, furniture, etc.There are many tourists and businessman often order those handicraft made of marble. They usually order for house furniture, interior, collection, tombstone, etc.